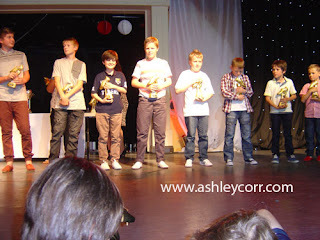 The annual Presentation was our first, after Christopher's debut season for Houghton Albion. His registration will continue next season, which begins in September, so we look forward to plenty more football and more great goals from all of our squad. I intend to get permission to photograph as many of these games as possible after my first and only attempt to date of photographing a football match (see photo's on my previous blog entry). Well done to Dave & Judith Smurthwaite (manager and secretary of Houghton Albion) for all their efforts during the 2011-12 season. Also to all the parents for their commitment, and most of all to the players themselves - a great bunch of kids who give 100%. To wrap up the season, until the next one, here are a few photographs from the Presentation Night. 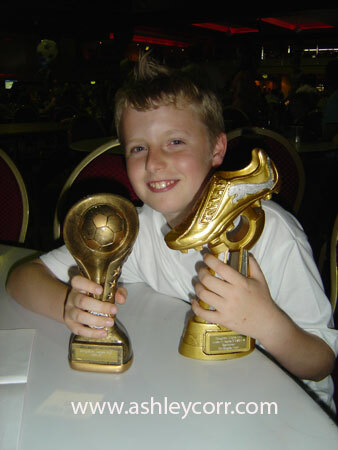 Christopher collected two awards in his first season. He is shown on stage alongside other aged players who collected their individual 'Sportsman Of The Season' award. 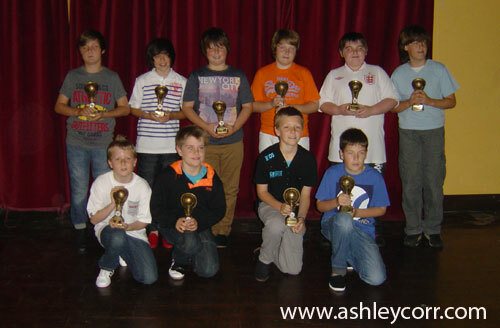 Also shown below is a shot of the Houghton Albion squad with their trophies. More exploits from Houghton Albion FC. Half way through the season we lost some players to other teams and as a result we struggled to field a full team of players for quite a few games. More often than not we were playing against eleven players, with only eight or nine of our own, and this led to some heavy defeats, both home and away. The morale took a hit on the remaining players, although they gave 100% as always. In some of these games we were lucky to get over the half-way line during the entire sixty minutes, but what can ya do when you're at such a disadvantage. Before one particular game, at Ryhope, an opposing player asked his manager before kick-off if they could even the game by only using nine players, against our nine, effectively leaving two on the touchline. 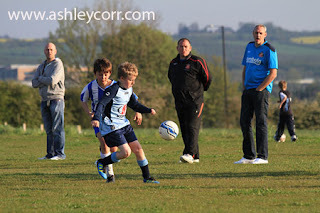 The young lad was promptly told to shut his mouth and then reminded WHO was the manager! 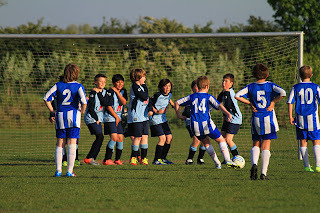 Well hey, there was a queue of parents ready to pounce on the 'Unsporting Gentleman' (look that up in the Houghton dictionary and it is also known as CHEATING B*STARD, he he). Anyway, they played the game 11 versus 9 and we got kicked off the park as well as slaughtered. I lost count of how many times James (our keeper) bent down to pick the ball out his net, around 12 times. I think the poor bairn knocked his back out after the last goal!!! Anyway, that was the last straw for Dave (team manager). After weeks of playing with only eight or nine players he thought it best that we dropped into the 9-a-side league, mid-season. Within a couple of weeks we had done just that, and were now playing all our games at the Russell Foster HQ at nearby Newbottle. 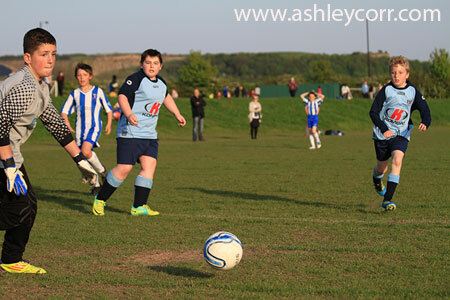 The site has numerous pitches and is packed every Saturday with teams of all ages, including parents and other spectators. The burger vans come in handy too! We had much better luck in this league, playing on our own pitch, week in week out. No more early morning starts, travelling to the likes of Ferryhill, Consett, Gateshead and Durham. A couple of new players arrived and competition for strating places hotted up. We put some great performances in, during what was left of a difficult season up to now. 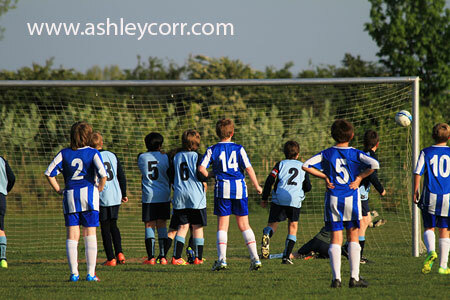 Goals were flying in and the kids were well and truly back on the up. Here are a few photo's from our last game of the season, against Boldon Cobra's. We were 2-0 up at half time, but after 60 minutes we lost the game 4-2. Two goals from Houghton's Jamie Fenton gave him the leading goalscorer of the season award, which was a three way tie going into this last game - Shane Smurthwaite and Christopher Corr being the other two players vying for the bragging rights. The first shot (above) shows Christopher launching an attack down the left wing, watched by some of the parents. The second shot shows another attack that ended in Brennan Robinson having a shot that scraped Boldon's goalpost before going behind for a goal kick. I was situated behind Boldon's goal, using a Canon 70-300mm lens (all singing-all dancing, BTW). The photo's below show a free kick that was awarded to Boldon Cobra's. This became their fourth goal - an outstanding effort that cleared the defencive wall and ended up in the top corner, after a fingertip attempt to keep it out by our keeper (Ross Walton). I fired off quick burst frames that captured the free kick, from the second the ball left Number 14's boot, to the point where it hit the net. Houghton Albion FC (Under 11's) brought the curtain down on another season recently, with a few new players on board, including my son Christopher, who registered with them one-third into the season. It was completely new territory for him - the only football he'd played previously was in the school yard and with his old man round Houghton Park! He said he was ready to join a team, so where better to look than a team from 'on the doorstep'. 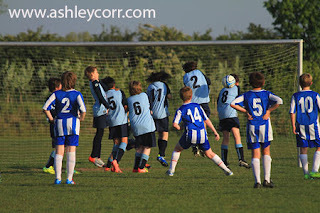 After a couple of Thursday night training sessions with his new team-mates, and a short wait for his registration to be accepted, he was thrown into his first competitive match against Durham Juventus Soccarena. This was an away game, just a couple of miles up the road at nearby Belmont. It was a miserable Sunday morning as me and the Mrs accompanied the next Wayne Rooney (he he) to the venue. 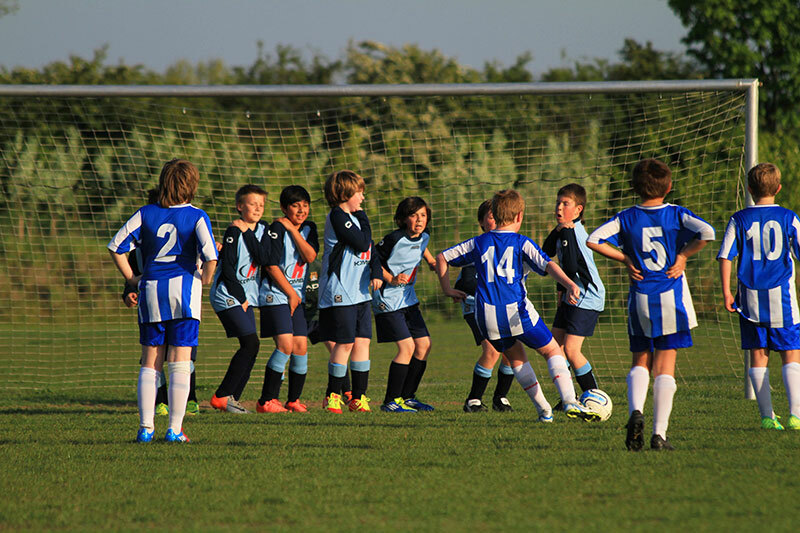 The game was fast and furious, end to end, but with few scoring chances. 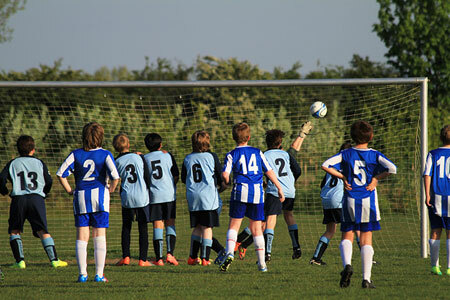 Christopher's school-mate Jael Anderson (the only female player on the pitch) scored from the penalty spot to fire Soccerena ahead. Albion kicked off from the centre-spot and formed an attack which eventually led to a corner. From the resulting corner kick there was a scramble and a defencive miss kick from the goal line saw the ball in the air. It was met on the way down by the debutant Christopher Corr who was first to react. Rising like the proverbial salmon (he he), he headed the ball into the net for a deserved equaliser. 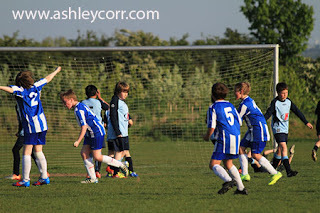 What a way to to begin your life as a footballer - virtually he first real touch of the ball! I think from this moment on he was hooked. Me and the Mrs were over the moon. The half-time whistle blew and it was all even, one goal each. The second half was much the same as the first - end to end, but not many shots on goal. One shot did find the net however, but unfortunately it was Durham Soccerena who took the glory. 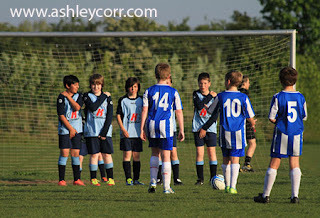 The game ended in a 2-1 defeat for Houghton Albion, but all the kids played out of their skin and were commended by all the parents and management after the post-match handshakes. A match to remember!